The average cost of a midrange bathroom remodel is $15,782, according to Remodeling Magazine's most recent cost vs. value remodeling report. While the conventional wisdom says that bathrooms and kitchens sell homes, such projects typically only recoup 65.2% of their cost in the home's resale value in today’s market, the report shows. Even so, that return makes bathroom remodeling one of the most valuable home improvements on our list. Of course, averages can be misleading. People who do expensive projects push the averages far beyond what the typical homeowner spends. Despite the high cost and negative return on investment, Consumer Reports says bathrooms are second to kitchens on homeowners' lists of rooms they want to remodel. The guest bathroom was high on my list of things to remodel in the fixer-upper home my husband and I bought in 2008. We weren’t about to spend $16,000 to remodel the bathroom. We were thinking more like $1,500 to $3,000. We faced a much lower potential expense because our bathroom is only 5 feet by 7 feet. That’s about the smallest space into which anyone outside of New York City can squeeze a bathtub, toilet and sink. We decided not to touch the bathtub, the surrounding tile or the shower doors. We don’t love them, but we also don’t use them, and they can be hidden nicely behind a shower curtain. We also wanted to reduce our risk of experiencing a bad remodel with an expensive leaky shower problem. To avoid laying out a ton of cash at once to pay for the remodel, we bought things gradually over five months and stored them in our garage. This strategy also let us take advantage of sales and coupons as they came up, which saved us $150. Our plan was to hire a professional contractor to do everything. We had waited so long to remodel that we didn’t want to mess it up with an overzealous attempt at doing it ourselves. After some difficulty in finding a reliable professional, we learned that an acquaintance worked for a general contractor. The catch? We would have to take a chance on someone less experienced. But then, we only had to pay $600 for labor, or 25% of our total cost. What we didn’t foresee was that our contractor would need a lot of help from my husband. He didn’t have a crew. We ended up with a combination of professional help and DIY. The project was supposed to take three days. It took much longer, but we were happy with the finished product. 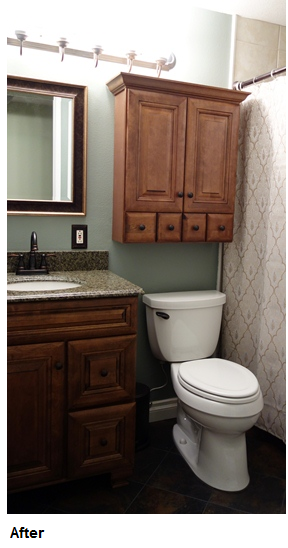 The bathroom vanity we so meticulously picked out didn’t match up with the sink plumbing. We had to shorten one of the drawers and cut out an extra notch in the back of the cabinet to make it fit — a multiple-day project. We had to replace the piece of wood flooring that transitions from the hallway to the bathroom. That meant two trips to the store to find a matching piece and a lot of woodworking to make it fit. After the first intense week of renovation, we dragged our heels finishing up out of sheer exhaustion. All in all, we didn’t have full use of our bathroom for three weeks instead of three days. Fortunately, we didn’t have any significant unforeseen expenses. What really added to the total bill were all the little things we didn’t think about budgeting for: tile spacers, caulk, a mixing bucket, assorted plumbing parts. 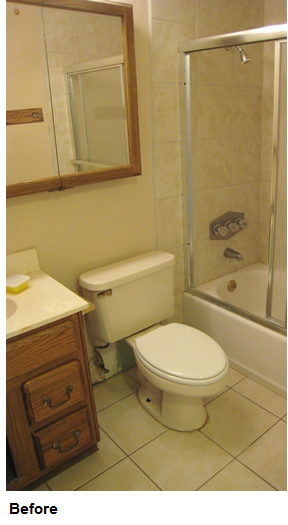 All told, the remodeled bathroom cost just under $2,400, including tax and labor. If we hadn’t already owned tools like a screwdriver, level, drill and wrench, we would have spent a little more. We could have saved money by purchasing floor tiles that were sold by the tile instead of by the box. We weren’t able to return six unused tiles worth about $20. We also could have purchased less expensive tiles, but since we had such a small space to cover, we didn’t mind splurging on a pricier choice. We could have spent $100 less on a toilet, but we hated our current toilet and didn’t want to repeat the experience. We went with a highly ranked, best-selling model. The plastic seat that came with our toilet looked and felt cheap, so we shelled out another $30 for a nice enameled one. Same goes for the toilet flush handle. We didn’t buy apartment-grade fixtures. We knew from experience that they aren’t a good value in the long run. Had we been on a tighter budget, we could have cut our expenses. But it was worth saving for longer to get what we really wanted. If you’re planning your own remodel, here are some tips for cutting your costs without sacrificing quality. Don’t borrow money. Paying interest adds to your cost. Save up and pay cash. Do anything yourself that you can. Most people can at least paint. Design your project yourself, if you have a decent eye. Buy nicer stuff from the big-box stores instead of high-end stuff from a specialty store. Pick out what you want, then wait to see if it goes on sale or you find a coupon. Don’t rent a trash container. Instead, gradually throw out the waste with your regular trash. Whether your goal is to remodel a bathroom for resale or for your own enjoyment, doing it the way we did makes a lot of financial sense because you may never see a financial return on your investment.